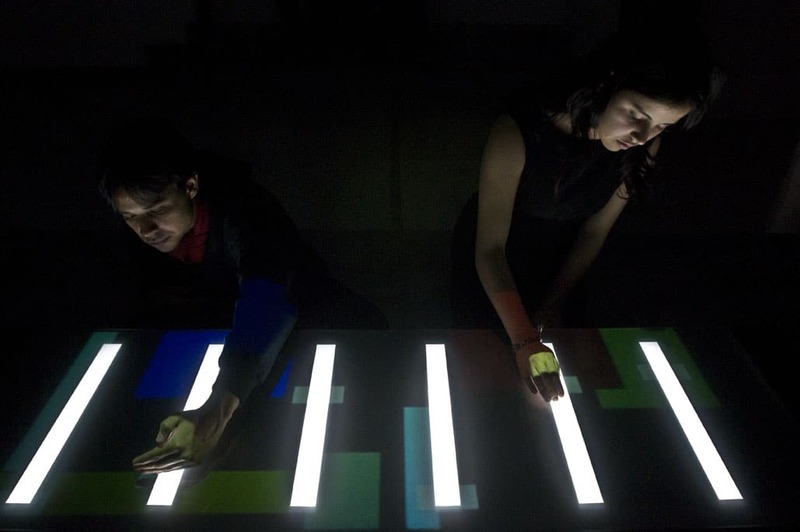 This interactive musical instrument is comprised of a luminous table, a real-time processing interface and nine speakers. Visitors slide the shadows of their hands over the luminous table to change the color and orchestral content of a musical piece by Alba Triana. Electronic Gamelan is the first in a series of works reflecting upon basic constituent elements in traditional music practice. This series poses questions such as: what is an instrument, what is a musical score, what are the rolls (spectator, performer, composer), what is a musical esthetic experience, what is music. These works propose redefinitions of music and its basic elements from a contemporary perspective, contextualizing them within the new mentality, technological resources and current life style. – The instrument contains its surrounding space. It is played without touching it, just using hands shadows. It can be performed by anyone, no need for training or skills. – The spectator is spectator and performer. The music is composed by the artist, but the spectators create their own version. – The musical composition allows transforming its timbre (color). Even though it is one musical piece, it has endless versions. – The orchestra is not made out of musicians but loudspeakers which delineate the spacial boundaries of the instrument. – The event is not a concert. It is a participative, interpretative, interactive, collaborative, musical and visual experience. – The intangible is present in the hands shadows, in the performers’ intuition, in their playing, in their interaction. – The work is the instrument, the musical composition, and to a greater extent, the nature of the experience proposed.